It’s hard to believe Mia is now nine months old. April 1st seems like it was just yesterday but clearly, it was nine months ago. She is growing and exceeding all her milestones most of which are before she is supposed to be hitting them. All due to the fact she has 7 older siblings she watches like a hawk and tries to mimic all day long. Although babies can start solids at 6 months of age (and I wouldn’t recommend trying ANY type of solid, not even cereal any earlier) she wasn’t ready. She has been a slow weight gainer but she is steadily gaining weight at her own little pace, happy and eats like a champ and always has. We knew at 6 months old she wasn’t ready for solids yet. She showed no interest. 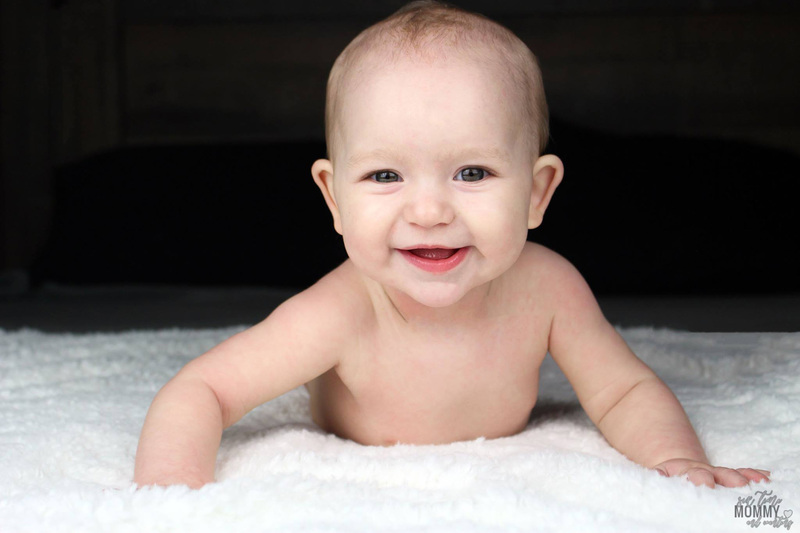 Can your baby sit up well? With no support? Is your baby watching you while you eat? Reaching for your food, or opening their mouth when they see you eat? Is your baby ready to chew? Can your baby pick things up? Pinch with fingers and can pick up food or other objects between thumb and forefinger? 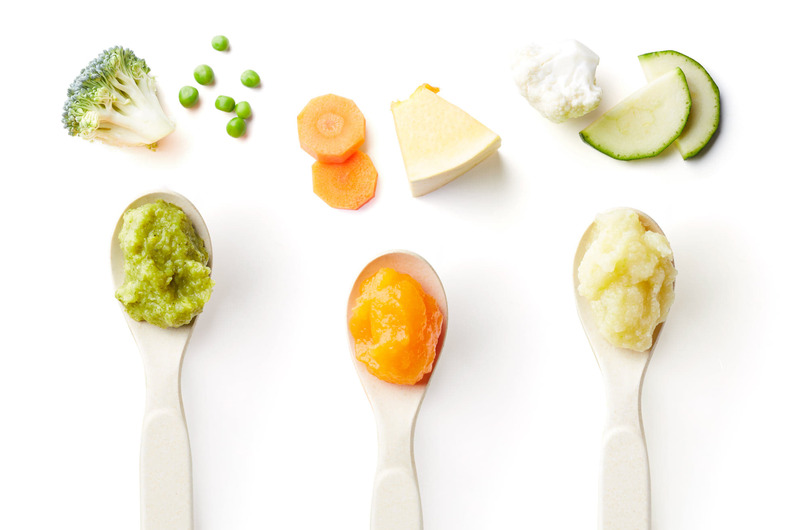 If your answer was YES to any of the above your baby may be ready for solids. It’s been said that if your baby has reached 6 months old and has a sudden increase in demand to breastfeed (that isn’t due to growth, illness or teething) then it may be an indicator that your baby is ready to try solids. Yeah, no. I’m not generally one to shame moms but this is a hard no for me. Babies are often not even close to ready at 4 months old. Being told to give a baby cereal before bed to make them sleep longer, or give them cereal/food so they wouldn’t nurse as much or drink as many bottles is dangerous, in my opinion. This is something when I’m asked by mom friends, or other moms in groups I tell them to research. REALLY RESEARCH. Of course, I’m no doctor I’m just a mom of 8 with years of experience but I’ve done nothing but research this for the last sixteen years. I’ve spoken to many doctors, read many studies and even heard all the pros and cons. I’ve also witnessed babies choke and even develop early allergies because of this. I’ve also seen babies flat out refuse to eat for months because parents tried too early and kept trying to push it. Why rush it? When studies show 6 months or more is beneficial and the guideline to follow, what could possibly make anyone want to do it sooner? Unless there is a medical reason that a doctor has given for the health of your child (and not to help them sleep more) then there is absolutely no reason to even bother before 6 months of age. Again, my opinion – so please do your research. As long as your baby is gaining weight, even if a little slower, I personally wouldn’t be concerned. I know sometimes doctors get in our heads, and there is a “curve” our babies need to be following – but remember that ALL babies are different. Baby #5 for me, Jackson, didn’t gain any weight from 2 weeks until 2 months old. He stayed the same weight. We had weekly check-ups at the hospital and although he stayed the same weight he wasn’t losing any. He was very alert, and he continued to grow long and remained skinny – today, he is 7 years old and although extremely tall he is still very skinny. That’s who he is. My daughter Ava, baby #3 was a chunk at birth. Met all her milestones as a baby and monthly, she is now a perfectly healthy weight but is very short. Just like her mama. Mia, baby #8, who was born at 38w,1d was born at 22inches long, and was 8lbs2oz at birth – she lost quite a bit of weight due to the fact she didn’t nurse for over 30 hours, and was only fed sugar water but has steadily gained weight, slowly, in her 9 months on earth. She wears 12-18 month sleepers due to being so long, and she is happy, thriving and exceeding her monthly milestones before they are due to hit. My husband is over 6 feet tall, and I’m only 5’5″. So, our kids are all either tall or short. They grew very differently as babies as some were longer, fatter, thinner, shorter. It all depends on the baby. As I’ve said, every baby is different. If your baby doesn’t start solids right away at 6 months old, talk to your doctor. Although, most have different views, talking to other moms helps as well. As long as your baby is thriving and isn’t losing weight you should be fine to wait until you feel your child is ready to start solids. My doctor was concerned about Mia. Although she is/was growing she was slightly under the “curve” which is an average of other babies her age, and her weight at birth. To me, it isn’t a 100% in determining how much a baby should weigh at a specific point. There are so many other factors: Length, Birth Weight, Discharge weight (and circumstances) and as I spoke to my doctor’s nurse and she dug a little deeper asking about Mia’s birth, and the horrific 36+ hours we endured after her birth she said it all made sense. So, while Mia is a little bit slower to gain her weight because she started off a little slower due to being a Gestational Diabetes baby, being induced, and having extremely low sugars at birth resulting in a NICU stay, IV and no nursing… it all plays a factor. We are now over a full month into Mia nursing as a main source of nutrients but also having added solids in her diet and she is loving it. She wasn’t ready at 6 months old, we waited until she was 7 months old and showing some signs. She wouldn’t have any of it, she just wasn’t ready. We waited 2 weeks and wouldn’t you know it – she flourished. She couldn’t get enough food, and she has been eating like a little piggy (after nursing sessions at breakfast, lunch, and dinner) and she loves it. When in doubt – do your research. Talk to your doctor, ask some mom friends their experiences and do what you feel is right. I always just say, educate yourself with research and you’ll know. Good luck!